For well over half a century Cracknell’s Farm have been rearing poultry in a natural and traditional way. All our birds are free-range and additive-free. 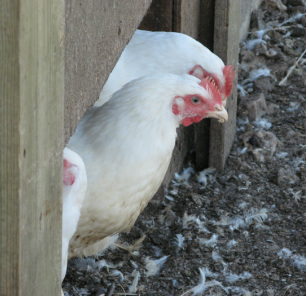 The birds come onto the farm as day-old chicks and remain on the farm throughout their lives. They are processed by Jeff and a small team of workers on a weekly basis, before being delivered to local butchers, farm shops or sold from the door. At any one time there are approximately 2,000 chickens roaming 9 acres of pasture, along with a couple hundred ducks. Goslings arrive in late Spring and are available for the table from Michaelmas through to New Year - they are a real treat. In fact we are told by many people that our poultry really does taste better than any other.